Transportation is about more than moving people. It’s also about moving the goods and supplies that support the Tampa Bay region’s economy. The freight transportation system consists of highways, railroads, airports, ocean shipping channels, pipelines, and truck routes that deliver raw materials to manufacturers, food to grocery stores and restaurants, fuel to power plants, medicine to hospitals, and packages to offices. The region’s economy simply would not function without the freight transportation system. 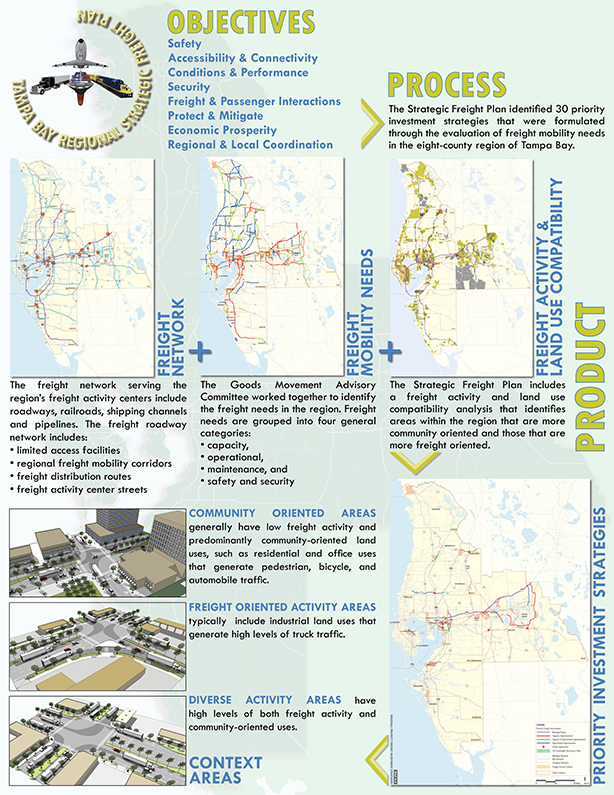 The Tampa Bay Regional Strategic Freight Plan recognizes the connection between freight and the region’s economy, and identifies strategies that will help move freight efficiently from freight activity centers (FACs) in the region while minimizing negative effects on neighborhoods. To view the Study Documents, click here. The Tampa Bay Regional Strategic Freight Plan was developed in response to steadily increasing emphasis on freight mobility concerns and economic development in recent years. The freight transportation system is a critical component of the regional economy. Efficient and safe freight mobility supports commercial and industrial growth, job creation, and a high quality of life. Some of the challenges to efficient goods movement include infrastructure conditions, infrastructure capacity, underlying economic conditions, government action, and freight interest representation. The Tampa Bay region’s freight transportation network is an extraordinary resource for the promotion of commerce, the creation of jobs, and the improvement in the quality of life of our residents. The specific improvement strategies appropriate for a given freight roadway facility depends not only on its freight transport function but also on the existing and planned land uses and activities within the corridor. The Strategic Freight Plan includes a needs analysis, which helps to identify priority freight investment strategies for the Tampa Bay region. The Strategic Freight Plan developed implementation guidance which outlines freight-supportive transportation strategies, facility design guidelines, and policies within freight corridors and subareas.